Other than hanging with my wife and children, there is nothing that I enjoy more than sharing my love of football with my fellow diehards. Six years ago, I decided to finally fulfill a life-time goal and publish my NFL Draft profiles and rankings. The journey has been incredible: I continually meet new and interesting people and learn from other draft analysts, college football fanatics and Twitter followers. I have plenty of hits and misses over the past five seasons and am determined to master my craft. In order to do so, I always reflect on my process and inquiry. What skills did I miss when watching a player? How do I balance film study, on-field production and athletic skills? Are elite traits an indicator of future professional success? Or is a well-rounded skill set a superior gauge? Does the prospect easily and quickly solve problems in real time? Are any of the aforementioned questions more important than another when ranking prospects? Trust me…I have not come to a deduction or conclusion that would change the scouting community. However, I am open to any and all suggestions to improve and recognize that the desire to be a better analyst is both the journey and destination. My analysis of every class of quarterback prospects begins in June when I identify my top twelve signal callers and outline a personal viewing plan based on each player’s schedule. I attempt to watch each future rookie as often as possible and take notes on their performance as the game unfolds. In early December, I organize my reports and rank the players based on their skill set and production. Next, I watch every bowl game in which a prospect plays and take more notes to cross check my previous breakdown to identify skills or holes in their games that I missed previously and to see if there is improvement. Finally, I envision a spectrum in which the prospects land for my ratings: On the right, a grammatically perfect technical writer of computer manuals (P. Manning and A. Luck) and on the left, a free-flowing novelist (S. Young and R. Wilson). This current class of signal callers has options of all styles to choose from. Ultimately, each NFL organization values signal callers differently based on offensive scheme and franchise philosophy as well as traits and skills preferred. Quarterback deprived teams have benefited from stellar options at the top of the rankings each of the past four years. Unfortunately, the Class of 2019 lacks the star power of previous Drafts. Demand usually exceeds supply at the position in the Draft and three quarterbacks—possibly four—will surely be selected in the first round in April. However, I only have a first-round grade on Dwayne Haskins and Kyler Murray. Since there are so many distinctive offensive systems, and the level of talent among programs in college football varies, touchdown passes, passing yards and accolades do not necessarily provide acumen into the player’s long-term professional outlook. Games Played, Passing Efficiency, Completion Percentage, Yards per Attempt and TD-to-Interception Ratio provide enhanced insight in order to rate the signal callers. Fashioned one of the paramount seasons in college football history. 2018 Heisman Trophy winner after completing 260 of 377 attempts for 4,361 yards and 42 touchdowns. Also, exceeded 1,000 yards rushing with 12 touchdowns. In high school, five-star prospect who won three state titles while winning all 43 games as a starter. Enrolled at Texas A&M and sat out a year after transferring to Oklahoma. Backed up Baker Mayfield in 2017. Freakish athlete at 5-foot-10 and 207 pounds. A fourth-year junior with rare athleticism. Elite playmaker: Elusive speed and lethal arm. Rapid release with good touch and ball placement. Finds throwing lanes and changes arm angles. Pushes ball vertically down the field. Generates lots of velocity from lower body. Whips tight spirals. Polished passer with clean mechanics. Delivers passes through small windows between blockers. Always in control under pressure: Keeps eyes downfield while avoiding rush. Quick feet and moves well in the pocket. Innate feel for pass rush: Easily escapes pressure and explodes down the field. Avoids big hits. Maneuvers in pocket well and makes good throws off balance. Lack of game experience and makes poor decisions at times. Holds onto the football too long. Challenges double coverage far too often. Waits for the receiver to uncover. Does not always see open intermediate route in the middle of the defense. Last nine quarterbacks to win Heisman all selected in first round of the Draft. Incredibly high-ceiling prospect with a low floor. Only Michael Vick and Johnny Manziel were shorter than six feet and selected in the first round. 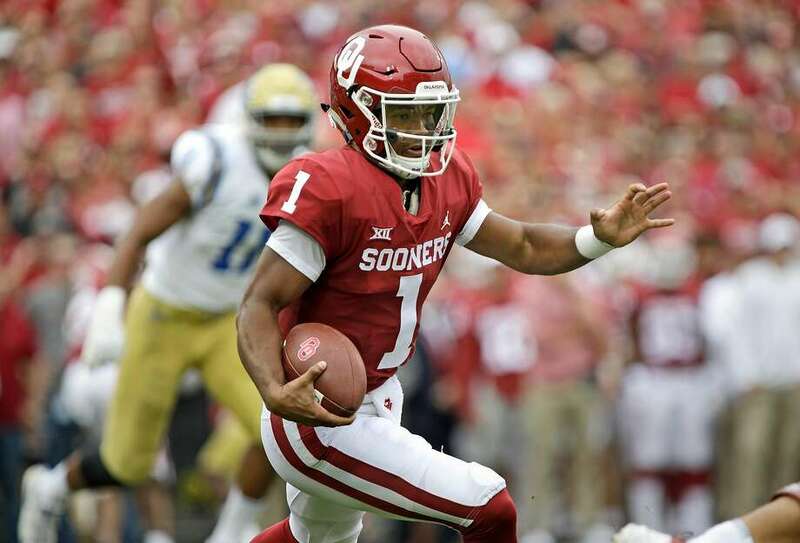 One team in need of a franchise field general (Arizona) falls in love with elite skills and selects the former Sooner first overall in the Draft. Possibly, the greatest all-time Buckeyes' passer. 2018 Big Ten Offensive Player of the Year. Established Conference single-season passing records for touchdowns (50) and yards (4,831). Only sixth player in FBS history to toss 50 touchdowns. Set school marks for completion percentage, total offense (361.7 ypg. ), 200-yards passing (13), 300-yards passing (9) and 400-yards passing (5) in a game. Academic All-Big Ten Conference in 2017. Idyllic size at 6-foot-3 and 231 pounds. As a redshirt sophomore this year, tremendous development as a full-time starter. Stupendous performances in big games against TCU, Penn State, Michigan and Washington (Rose Bowl). Early in career, pressure disrupted mechanics and became rattled with opponents in face. As 2018 season progressed, learned to trust eyes and remain calm while defenders attacked. Much better pocket maturity and command. An accurate pitcher with a quick, overhead release: Hits targets in stride with velocity. Good mechanics on three-step drops: Plants final foot in ground and releases ball immediately. Outstanding zip, placement and accuracy. Very good short and intermediate passer. Throws excellent deep passes when mechanics are solid. Manipulates defenders with eye discipline and movement. Fluid body control and athletic ability. Mobile competitor who absorbs contact well. As a runner and scrambler, extends plays with quick feet and change of direction skills. Marvelous mental makeup and great poise. Inquisitive learner who asks questions and wants to advance. Processes information well and makes rapid decisions. One-year starter who played in an offense that often-required half-field progressions. Must work on full-field reads. Very high-ceiling prospect, who displays franchise-changing traits. Polarizing prospect in the scouting community. Played at Florida as a redshirt freshman in 2015. After testing positive for performance-enhancing drugs and sitting out for a season, transferred to West Virginia. In two campaigns at Morgantown, established school-record with 19 games over 300 yards passing and tossed five touchdowns in five games. Fifth-year senior and puzzling prospect: Occasionally, displays elite abilities with sensational jaw-dropping plays while at times makes “what were you thinking” throws. Fearless freelancer who wants to hit a home run. Great rhythm passer who scatters ball to gamebreakers. Effortless pitcher with premier ball placement skills and live arm. Processes pre-snap reads and makes worthy decisions. Gets ball out of hands quickly and throws tight spirals with anticipation. Trusts receiver to uncover on routes. While on the move, can drop football into a bucket. Mobile competitor: Keeps plays alive with quick feet. Good pocket command with poise and patience: Slips and slides, avoiding pass rush. Operated in wide-open system. Gunslinger mentality. Lacks ideal size at 6-foot-2 and 217 pounds. Under extreme duress, penthouse or basement outcomes. When forced off platform, struggles to complete vertical routes. Must mitigate poor decisions and suppress superman ego. Will be 24-years old when season kicks off in 2019. Wide-range of professional outcomes. In four years, could be a backup or a quality starter i.e., Jake Plummer and Dak Prescott. I’ll bet on the former option among the two possibilties. In SEC history, ranked among the top passers after an illustrious career. 2017 All-SEC First Team and 2018 All-SEC Second Team. Four-year starter at Missouri. In 2017, established a conference record for single-season passing touchdowns with 44. In the SEC, concluded career second all-time with 12,193 passing yards and third in passing touchdowns with 99. Tops in SEC history with 1,553 attempts. Prototypical size at 6-foot-3 and 228 pounds and tremendous physical traits. NFL arm talent: Throws tight spirals with lots of zip. Strong arm and stretches defenses vertically with the flick of the wrist. Completes deep passes outside of the hashmarks. Makes throws at a variety of arm angles. Reads blitz and remains calm most of the time. Finds “hot” receiver. Short-term memory: Does not allow a bad play to disrupt game. Takes punishment and remains focused. Underrated mobility for a big athlete. Gunslinger ego: Squeezes ball into any window no matter how slight, producing eye-scratching decisions. Improvement in pre-snap checks, blocking protections and full-field progressions. Performed under two different offensive coordinators (Josh Heupel and Derek Dooley) past two seasons. Sporadically, poor footwork leads to misplaced throws and makes questionable decisions under duress in the pocket. Stares down primary target and does not make progression reads well. Lapses in judgment under pressure. Slow to scan the entire field. Not an anticipatory passer: Waits until receiver uncovers. Inconsistant footwork. Intermittently, drifts and fades backwards in pocket with happy feet when rusher bears down. During last two years, stupendous performances against Group of Five teams but disappointed versus SEC schools. Must improve on touch passes. Can he improve on accuracy in NFL? History does not foreshadow many examples. A blend of Drew Bledsoe and Jay Cutler. Physical gifts and upside potential likely propel Lock into first round. Four-year starter and remarkable campus tenure: Concluded Broncos’ career second all-time in passing yards (13,578) and touchdowns (90) and all-time Mountain West leader in passing yards, completions (1,036) and 300-yard passing games (21). In 2018, earned MW Offensive Player of the Year, and in 2015, named MW Freshman of the Year. Three times designated All-Mountain West First Team (2015, 2016 and 2018). Finished career with a 37-12 record in games started. Nephew of Super Bowl XVII MVP Mark Rypien. One of the top high school prospects in the state of Washington after throwing 50 aerial strikes as a senior. At 6-foot-2 and 210 pounds, quick release and an anticipatory passer with touch. Marvelous mechanics with good footwork, maintains a wide base and fluid throwing motion. Took snaps from under center and drops back well. Commands and climbs the pocket under duress and identifies a safe spot to throw. Reads progressions well and does not panic with defenders advancing. Keeps eyes scanning downfield and manipulates secondary. Rhythm passer: Precise short-and-intermediate pitcher who throws a nice deep ball. Hits receivers in stride. Tremendous intangibles. Fabulous football intelligence: Enjoys watching film and talking the game. An up-and-down career but improved dramatically final season on campus. Undersized frame and average arm strength. Floats deep passes at times. Below average mobility. Intermittently, locks onto primary target. Underrated prospect who has a nice professional career ahead. The most overrated quarterback in the Class of 2019. Redshirt junior who ended campus tenure second in total offense (9,524), second in total touchdowns (69), third in touchdown passes (52) and fifth in passing yards (8,201). In 2018, established single-game mark with 547 yards of total offense against North Carolina. Well-coached prospect absorbing knowledge as a counselor at the Manning Passing Academy and learning under Duke coach David Cutcliffe. Dissects defenses well pre-snap: Knows where to go with the football. Identifies weak spots and swiftly moves from target to target. Very good play-action (RPO) quarterback. Baits defenders with eye movement. Quick release and gets the ball out of his hands at the top of the drop. Good timing, touch and placement on throws, allowing receivers to gain YAC totals. Clean drop back and good footwork. Patience in the pocket. Light feet for a big man. Very tough competitor and ideal size at 6-foot-5 and 221 pounds. Team captain as a sophomore and steady leadership demeanor. Great preparation and spirit: Inspires teammates. In 2018, suffered fractured clavicle in non-throwing shoulder and returned to action two games later. Throws football into difficult spots in zone coverage. Deep passer with trajectory and air under the ball. Intelligent leader who limits mistakes and turnovers. Played predominately in shotgun formation at Duke. Limited arm talent. Slow delivery. Struggles to zip passes into tight windows. Senior Bowl MVP after throwing for one touchdown pass and rushing for another. Scouting community is higher on Jones than myself and an organizaton likely ranks him among the top two or three signal callers in the Draft. With his Masters in history and professional experience as an educator, John Laub is uniquely qualified to research, analyze and discover new insights and trends in college and professional football. Laub has played fantasy football for thirty years and published articles for FootballDiehards.com for well over 20 years. He won $10,000 in 1993, defeating nearly 15,000 owners, and published Audibles: Winning is Everything in the 1990s. He truly is The Gridiron Scholar.